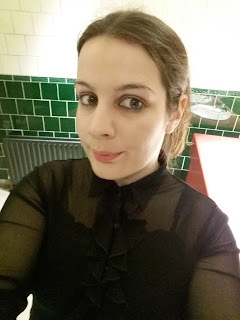 My posting appears to be a recurring theme with belated blog posts; it's just been another busy time. The day began by adapting a sewing pattern I printed from the internet, I modified the top arms holes by using another patterns sleeves, copying the arm seams and cutting the pattern. 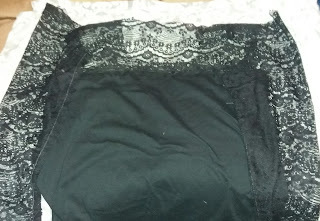 I cut out two different fabrics to make a top, lace for part of the top, sleeves and jersey cotton for the main body. I felt like dressing up and donning make-up; at times, I do occasionally feel the need to goth up. 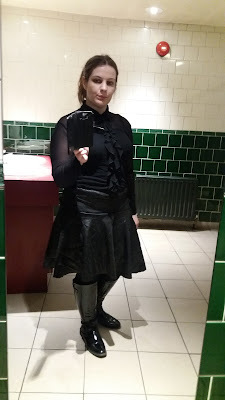 My outfit: Blouse, polyester chiffon from Next charity shop find, skirt made me for less than £2 and PVC boots Primark. This is a close up of the fabric of my skirt its lycra that looks like embossed leather. 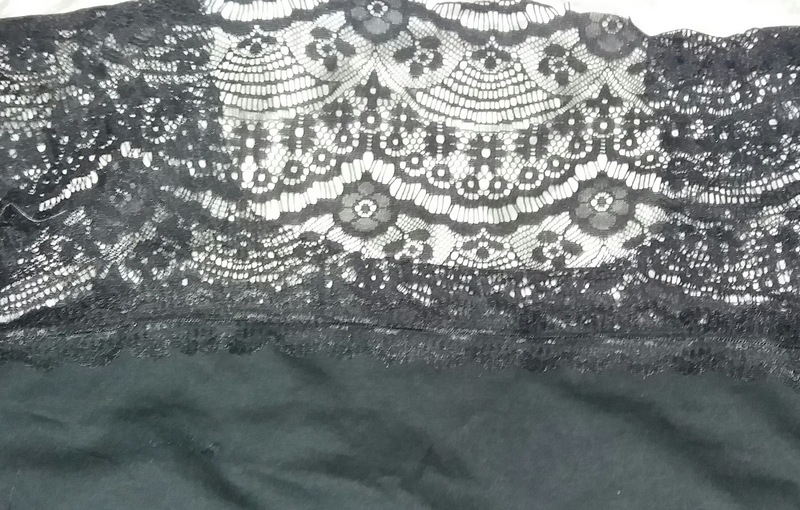 Before attending the quilting group, I ventured to a fabric shop I haven't been into for a while and found some lace print poplin for £5.50 a metre, which may use for a summer top, still in consideration for the fabrics use. I head towards the Shipley Art Gallery and quilting group. 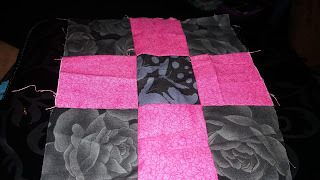 I'm highly enjoying the quilting group as I've finally discovered a use for my scrap fabrics. 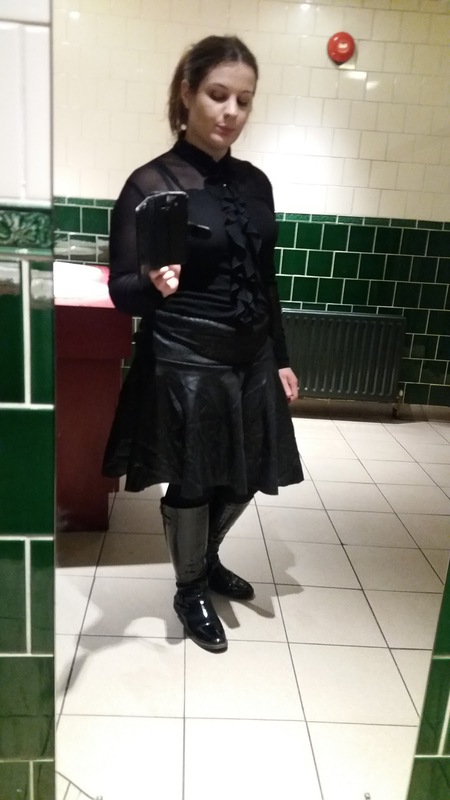 Most of the ladies who attend the group are retired, and the younger members are in their late fifties, making me the youngest member at 27-years young. It still amazes me the sprightliness of the members despite being in their ages and, the oldest member is 95; she attends with her daughter is crafting regular by knitting and quilting. All the members have a vast wealth of knowledge; everybody is so supportive and friendly offering their wisdom and experience. Everybody has often donated old quilting books and magazines for inspiration. 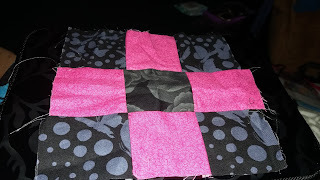 I started the project without any idea of what wanted to create, so one of the members suggests making a nine square pattern. 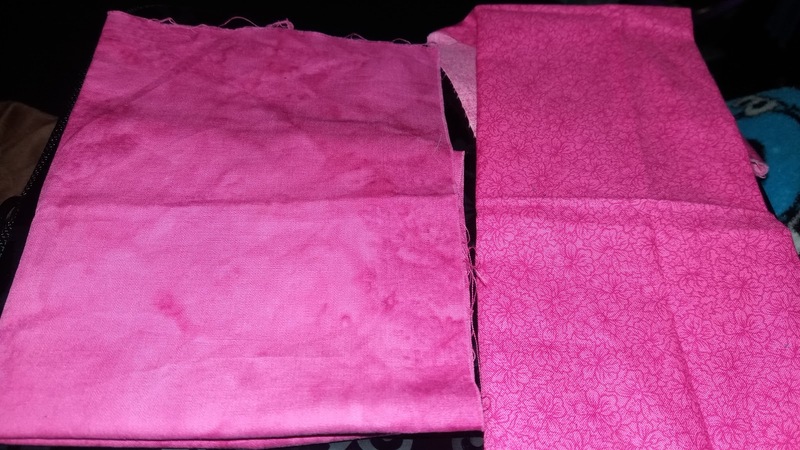 Most of the colours are a combination of designs using blacks, greys and dark purples, I managed to find some pink scraps of fabric in my sewing class, so I showed these to the members who recommended I should use them and I they make the other pattern and colours stand out. On first accounts I felt sceptical, now the patchworks progression I can see the impact. 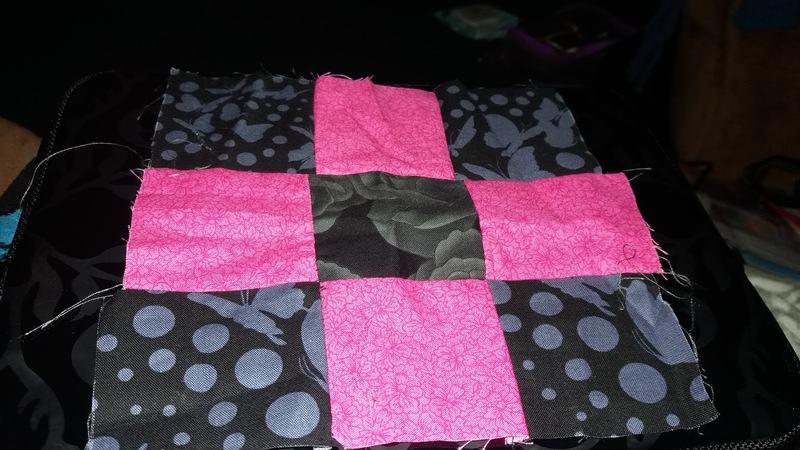 My patchwork will become a cushion cover. 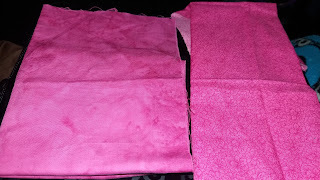 I got lift home started to sew up the top; I cut out earlier on the day. I met the boyfriend at the pub and afterwards, we decided to eat out at a local Italian restaurant. 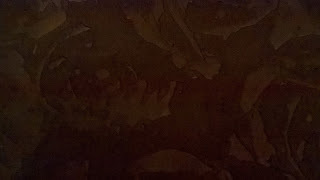 My posting appears to be a recurring theme with belated blog posts; it's just been another busy time. Aww I love your top! You look so pretty! The top looks like the one I have been wanting! I guess I will have to make it sometime! The cushion cover looks like it will be great too! 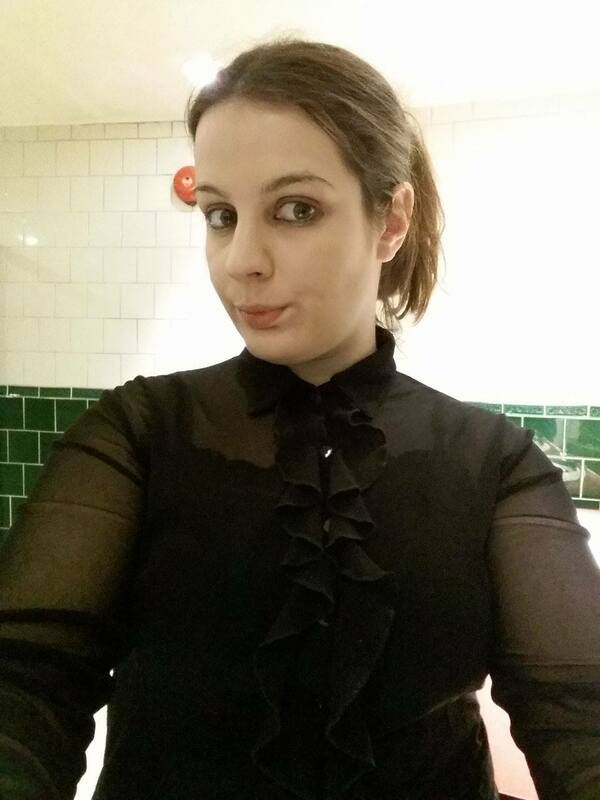 I love the blouse you are wearing! Thanks. I took inspiration from simular tops Ive seen in the shops but most them were madde from polyester (I lothe wearing polyester). 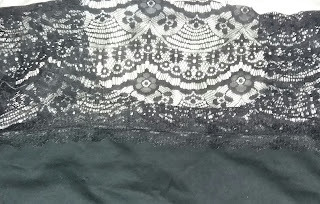 Your lace top looks like it's going to be fabulous! Thanks your so kind, i spent most of my time with the elderly. Thanks, this is a rare outfit. 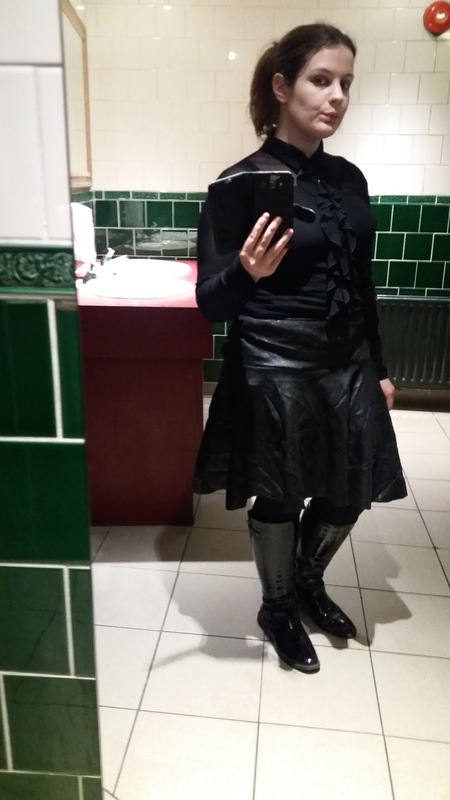 I normally dress up occasionally as I've often confess i look like travelling student with dms.